The blood-thirsty Tyrannosaurus rex of our favorite books and movies may not be so ferocious after all. According to a team of dinosaur researchers, the so-called King of the Dinos was more like a scavenging hyena than a hunting lion. After a 12-year study of dinosaur skeletons uncovered in eastern Montana, the researchers said there were just too many T. rexes for the animals to survive solely on prey killed by themselves. "The census data would suggest that it's like a hyena, just an opportunist. It would be just as likely to eat something dead as it would eat something alive," said John "Jack" Horner, one of the study's researchers and curator of paleontology at the Museum of the Rockies in Bozeman, Mont. In general, he said, prey outnumber predators by a 10 to one ratio. But in the Hell Creek Formation of Montana, which includes fossils from 65 million to 95 million years ago, researchers found 72 total triceratops, 44 Tyrannosaurus rex and 36 duck bill dinosaurs, he said. "The fact that we have so many of them does suggest that the T. rex is doing something different [from predators]," Horner said. Still, though science points to a picture of T. rex as a less-than-lofty scavenger, Horner acknowledged that the research turns pop culture's image of the ravenous "king of the dinos" on its head. "I think a lot of it is just people's preconceived idea of what a big, meat-eating dinosaur should do. We see it in Jurassic Park. We see it in the movies," Horner said. "T. rex is a big, mean, nasty thing, and the most honorable thing that a big, mean, nasty thing can do is be a hunter." For decades, Horner and Mark B. Goodwin, a paleontologist at the University of California at Berkeley, have been digging for dinosaurs across eastern Montana. In 1999, the two paired up to focus on the Hell Creek area. They identified and catalogued the skeletal remains of dinosaurs unearthed within the formation, which covers about 1,000 square kilometers. They published their findings in February in the open-access journal PLoS ONE. "The Hell Creek project was not just to look at T. Rex but to look at the whole ecosystem, collecting everything," Horner said. 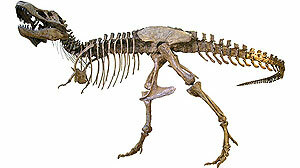 "What we discovered was triceratops was the most common dinosaur and T. rex was second and duck bills were third. … The really rare ones, of course, were the predators." "If you compare it to the Serengeti, if you line up the lions and the cheetahs and the leopards, their number still doesn't equal that of the hyenas. Opportunists are common in their ecosystems, and the T. rex is equally common in its ecosystem," he said. For years, he said, he championed the idea of the T. rex as a pure scavenger, because it didn't share the characteristics of traditional hunters. For example, it wasn't a fast runner, like the cheetah. Instead, the T. rex could smell at long distances and had bone-crushing teeth -- two characteristics helpful for creatures that eat the spoils of others, not solely the prey of its own. But this recent study is really the first scientific exploration of the theory, he said. "We generally put down scavenging, even though we are scavengers ourselves -- that's probably why we put them down," he said. "You'd think that scavenging would be considered the more intelligent way to get meat. You let somebody else do the dangerous work and then you chase them away." Is the Ferocious T. Rex a Thing of Fiction?